Happy New Year to you! ZvaCreative and our talented NEW 2013 Design Team welcome you to our December blog hop where we officially welcome our new team members to our monthly hops! We are very excited about this year's team and are sure that you will be inspired by and love their work.Are you ready to hop along and get to know them better? This is a photo of my siblings and me wayyyyyy back in 1966. I was almost 2. I am the one sucking on my thumb. It was my signature look until I was probably 14 or so. Actually I was old enough to remember how difficult it was to quit sucking my thumb, so yeah, 14 sounds about right. hahahaaaa. My dad was the photographer and he had a funny way of getting us to laugh. He recently told me that he'd hop around the room and roll on the floor till we all giggled. I count myself lucky that he is still here to answer those kinds of questions. He is still silly that way - though no more rollin on the floor for him. Those days are long gone. 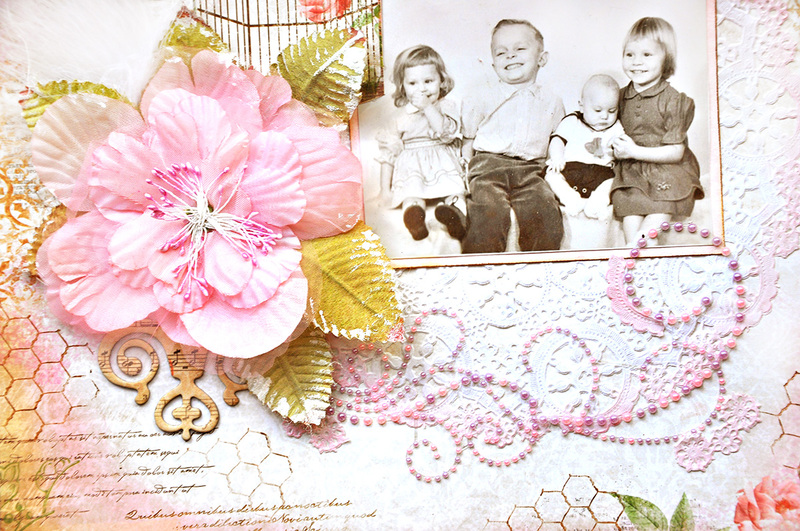 This was created using elements from the Scraps of Elegance Kit that featured the Bo Bunny Little Miss collection. CRX-05CB-133 Pink Pearl - at the top right corner. Very delicate and soft. CRB-05CA-122 Lavender/Pink Pearl Flourish - at the bottom. I cut this in half to swirl around my doily more closely. FL-04CA-102" Flower with Leaves in Pink . I gave the leaves a bit of gesso-ing (yeah I turned gesso into a verb...hahahaha) for a more subtle touch. FL-04CA-111 -1.5"leaves- these are found at the top and a few placed around the flower. I also gesso-ed the tips of these leaves. If you would like to play along with our design team, just follow along the blog path. I am linking to one of the Zva designers and that designer is linking to the next and so on. Be prepared to beinspired along the way! The Blog Hop starts today, December 31st and runs through midnight US Eastern Standard Time on Tuesday, January 1st. The blog hop begins here at Zva Creative's blog. Your next stop is Jolanda Meurs. Enjoy! Thanks so much for looking and spending your time here. Additionally, Erin Blegen who will not only be on the DT, but also in charge of marketing and our wonderfully organized DT coordinator, Valerie Serfozo. I am honored and thrilled to be on the launch team of these elegant new chippies. Looking forward to working with this talented team and with Blue Fern Studios. 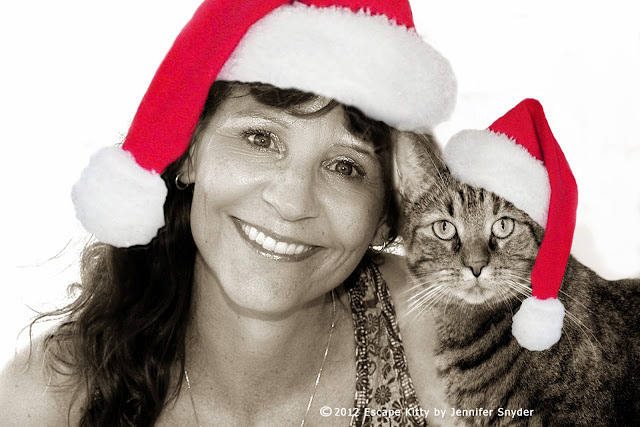 Kitty and I wishing you and your family a Merry Christmas, Joyful Holiday Season and Happy New Year. Kitty promises to be a little less sassy in the new year (OK that's my wish - but since I am typing and she's not, I'm putting MY wish out there). See you all in the New Year. May it be even brighter than 2012. All these beautifully talented women are Maja Girls for 2013. 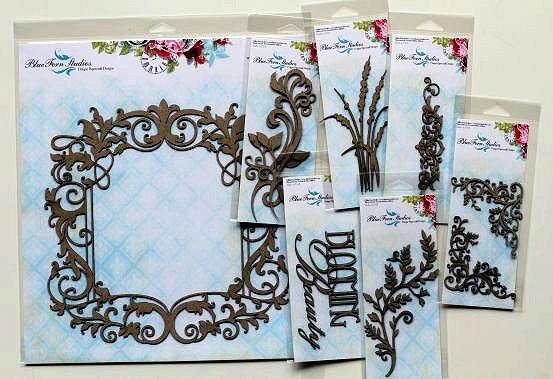 Maja Design is innovative, high quality and well designed paper for scrapbooking and crafts. 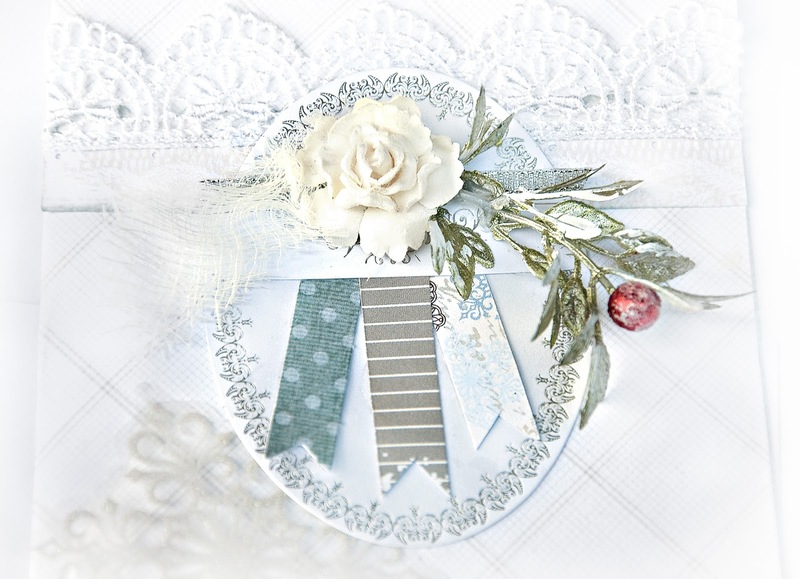 Our unique patterned paper are all inspired by romantic vintage style. 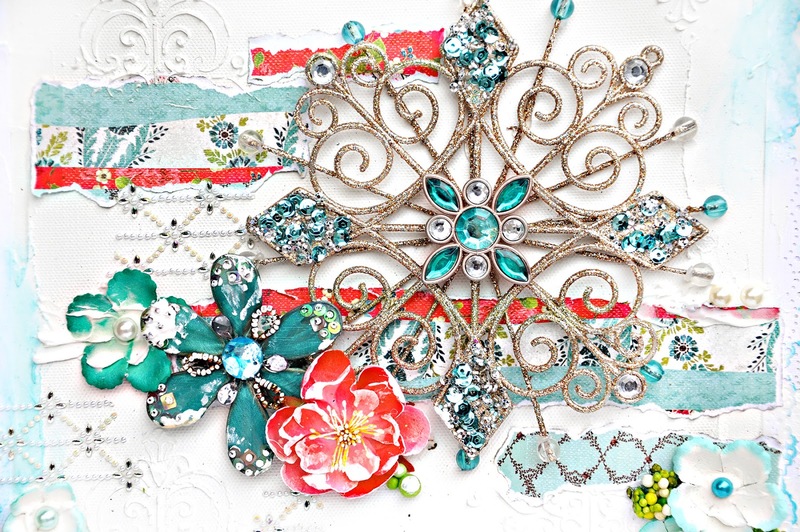 We hope our beloved designs will inspire you to create great joyful creations. I am over the top thrilled to be on the Maja Design team and am looking forward to sharing the amazing products with you through my designs and art pieces. 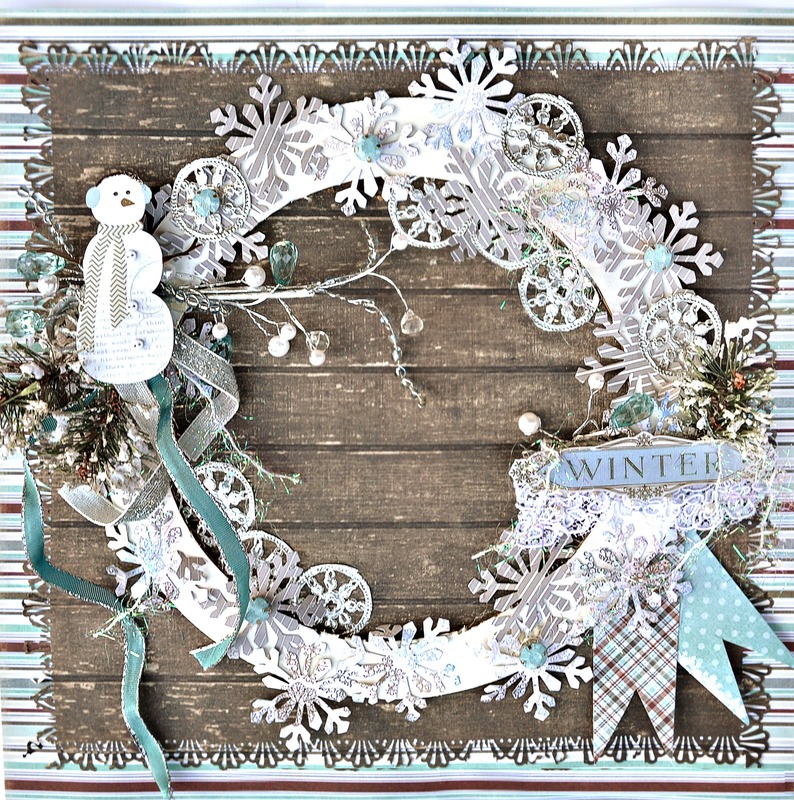 This was created using the gorgeous wintery December kit from Scraps of Elegance. The kit papers were Bo Bunny Powder Mountain. 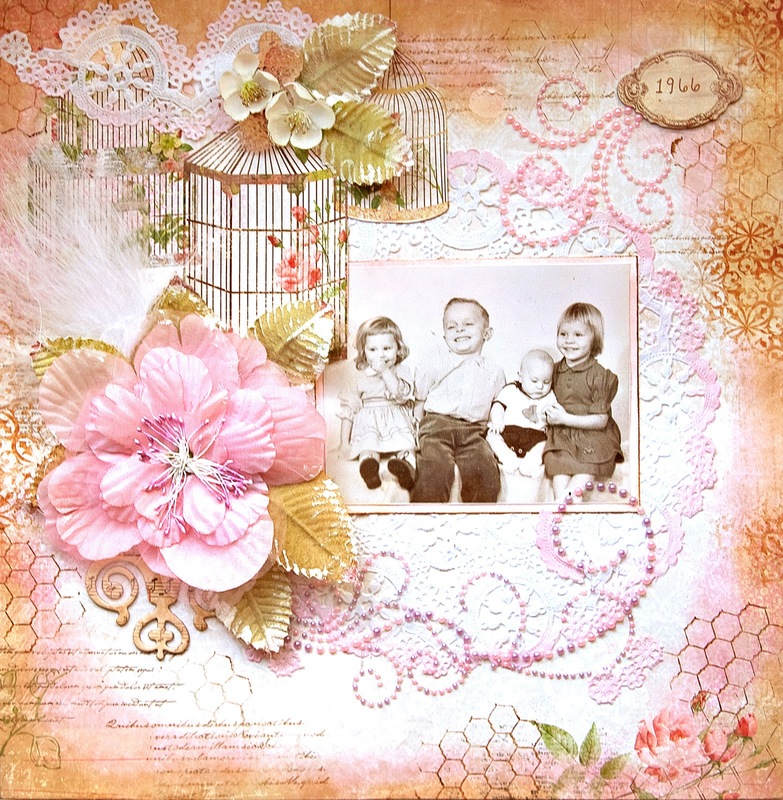 The kit also features the wonderful handmade butterflies from Renea Harrison. The photo is from my friend's Facebook page. I saw it and asked if I could scrap it. I know it is hard to see but she has her hand extended out and a small Blue Jay is perched in it. 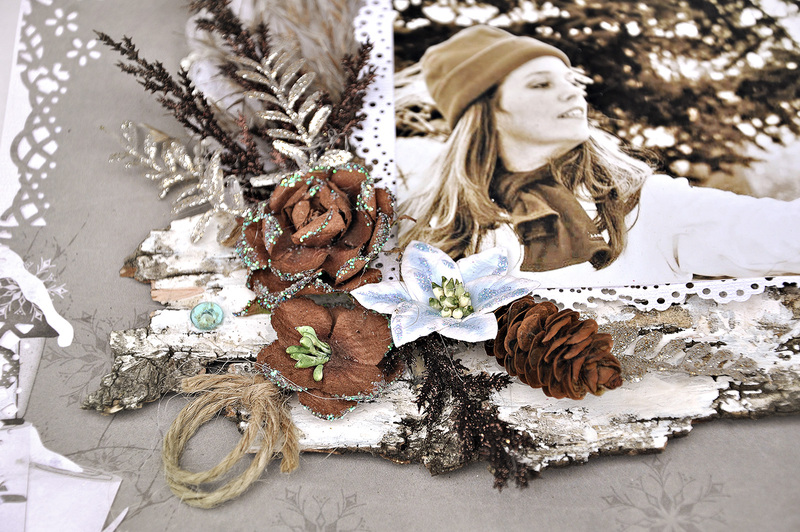 I used a piece of the birch bark I had leftover from a previous project. It picks up the snow covered birch tree stumps in the Bo Bunny paper. 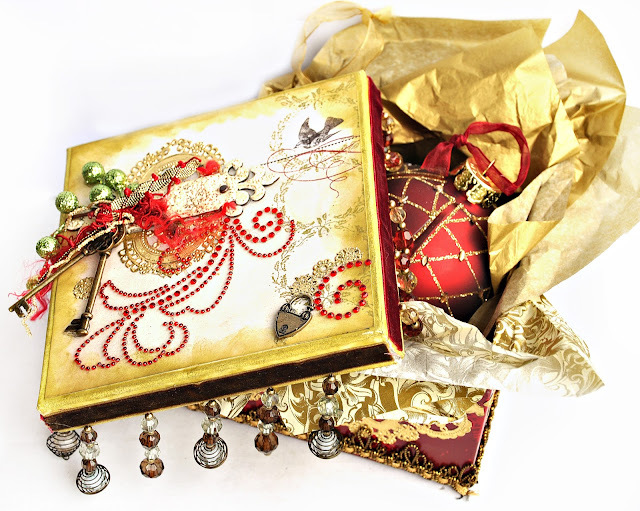 Come join us at Scraps of Elegance and create something beautiful today. Thanks for looking and spending time here. 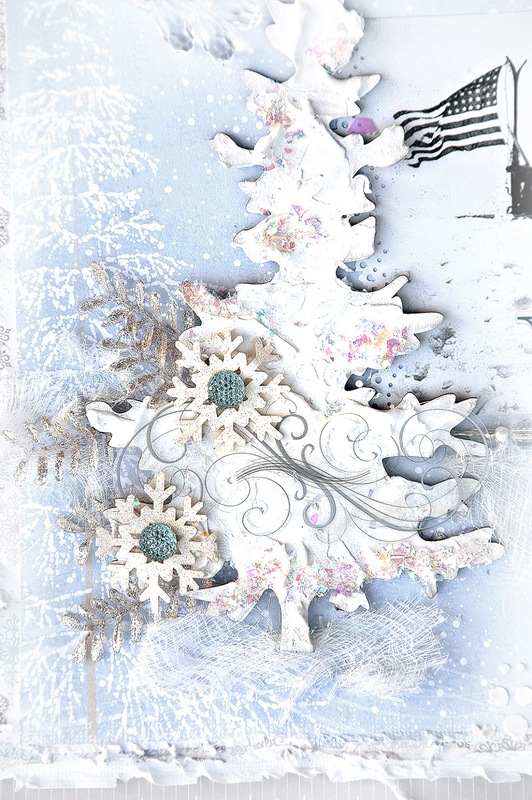 I used a Christmas tree ornament as the base for my creation. 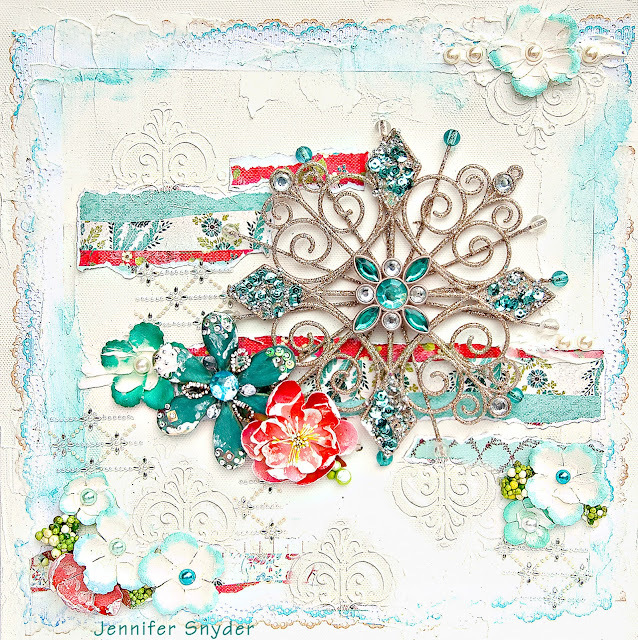 Then I dug around in my Prima drawer and pulled out the colors that worked for me. Most of the Prima stash is older but wonderful. Loads of moulding paste and some Prima bling finished this off. green was a tad hard for me to work in so I only dabbed it here and there with green floral berries. 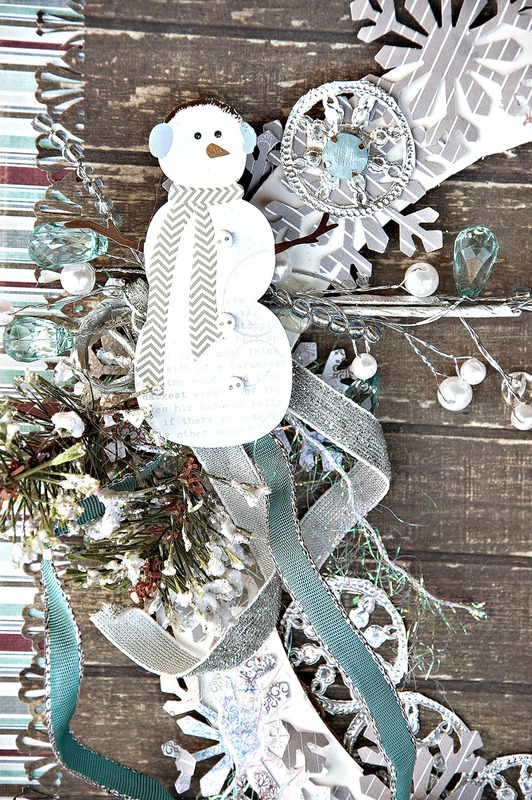 Prima PPP for December has the most gorgeous combo. I did spray some Tattered Angels Glimmermist Santa Baby red on my pink Prima Bel Canto flower and then wipe off the eccess to make it more red than pink. I also used a paint brush to paint the paper with the same Tattered Angels glimmermist in Santa Baby red to give that a reddish appearance as well. Ever create something that you wished you didn't have to give away? This is one of those times. My boss asked me for a quick last minute creation for his wife for Christmas ( a week before Christmas mind you). He is buying a house and he wanted me to create something using the photos of the new house to surprise her. I do believe he had scrapbook pages in mind. 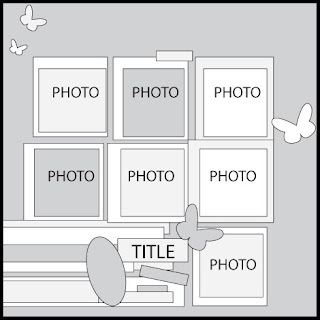 He handed me 11 photos. Egads. I think that means he was expecting some type of collage style layout. Now that's a real challenge for me -kind of frightening. I admire work that can incorporate several images. That takes skill - a skill I don't have. Perhaps I should say a skill I do not have the patience for at this point in the Christmas countdown. Fortunately for me, I salvaged a candy box from the office. It had Lindt Truffles in it. mmmmmm I can still smell a hint of sweet chocolates. 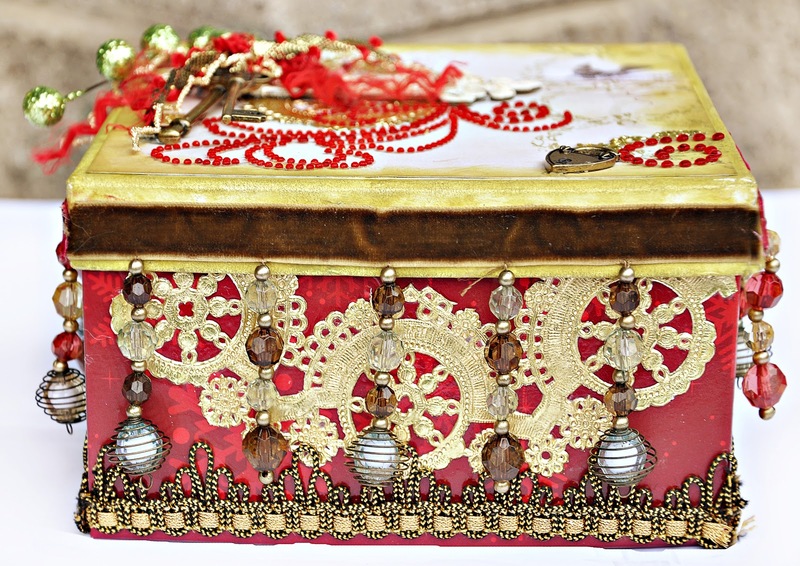 The box was perfect because it needed no painting and no prep work. My kind of project a few days before Christmas. What can make a girl feel special? Bling. oh yeah, she's a blingin' kind of gal too, so my project must have some ZVA bling on it. Quick, simple, easy. Pop some ZVA crystals on the top, a gold foil doily, some beaded velvet trim and it's oh so elegant. And oh so done. I also used some vintage style keys on the top of the box to convey the sentiment of the gift - which is the new home. 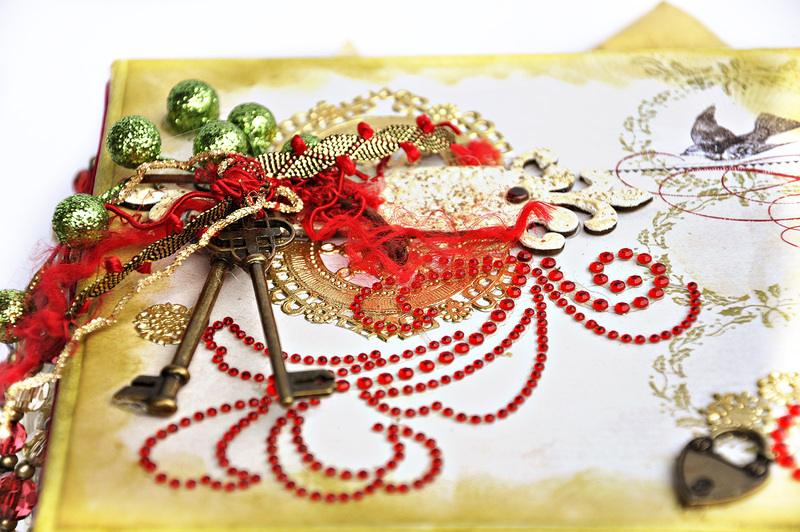 I used ZVA Flourish Crystal in Red CRB-05CB-104 for the crystal accent piece. Here are some close ups. 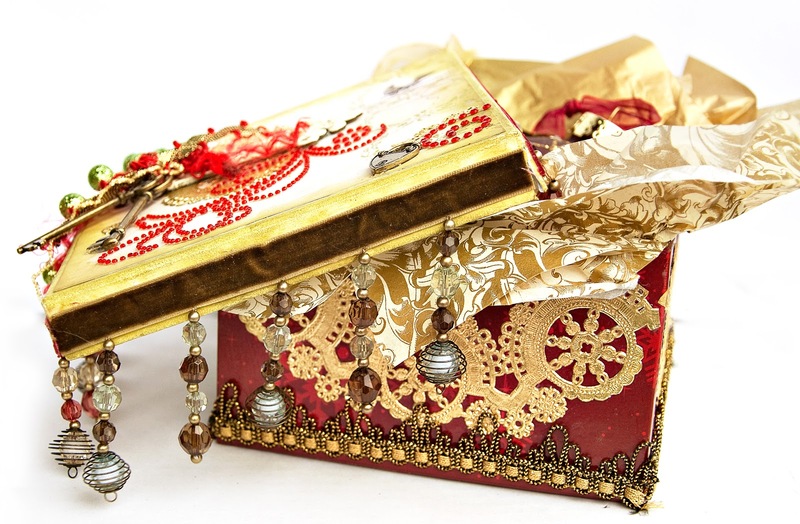 It is so hard to get a feel for the elegance of this box. Thanks for visiting and taking a look. I appreciate this a great deal. Here is a wall hanging I made to brighten up the dull winter days where I live. I can't think of anything better to brighten up your surroundings than bling. So I added some ZVA crystals to my project. I left some of the plastic backing on the crystals that dangle off the plaque to give this a little more dimension. By leaving the plastic backing on the flourish, I can easily use the ZVA in projects like this because it holds it's shape so perfectly. The flourish I used is ZVA Flourish V - Iridescent Crystal CRS-05CA-112. 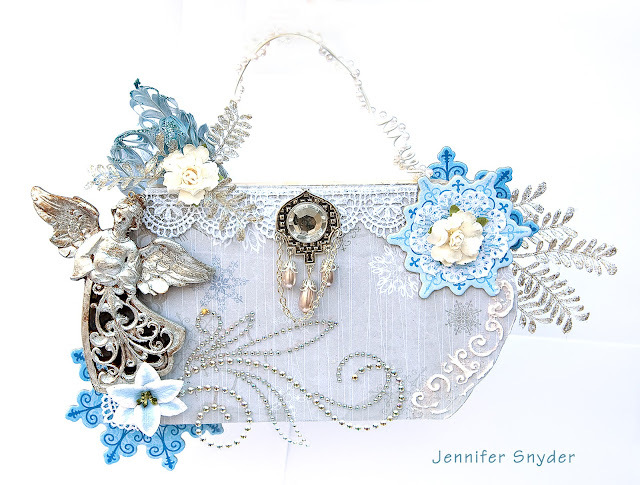 I paired it with a Blue Moon jewelry piece I snagged from the clearance bin at my local craft store. 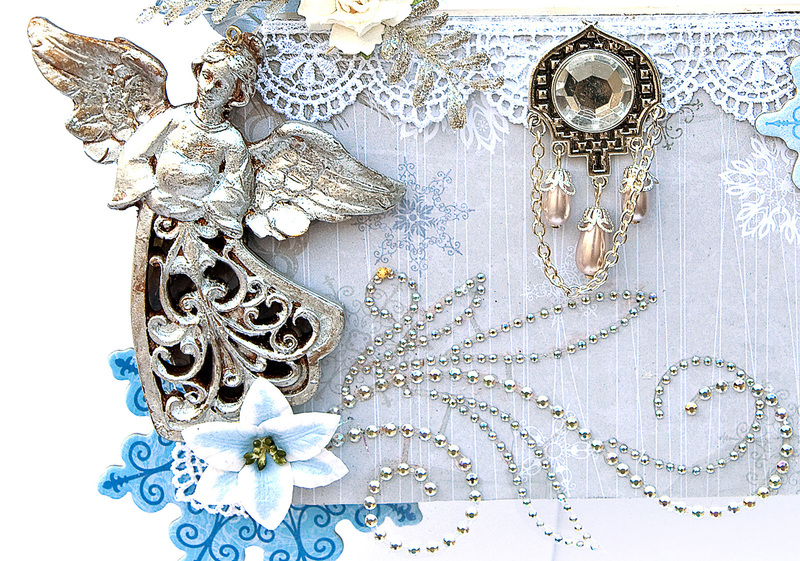 I also altered a Christmas ornament that I bought on clearance by painting it with Rub N Buff Silver leaf.. The plaque piece is clearance from Halloween. I am using my wonderful amazing Scraps Of Elegance Kit from Dec. to complete this wall hanging. If you are thinking that I am clearance Queen, I am. Feels great to actually use some of my treasured finds. Husband is happy that I am using stuff too and not just buying and storing. I store more than I probably should. Not hoarder caliber yet, but more storage area is certainly a little crowded. I am betting that you, out in scrappy world, are no different. Here is a close up. 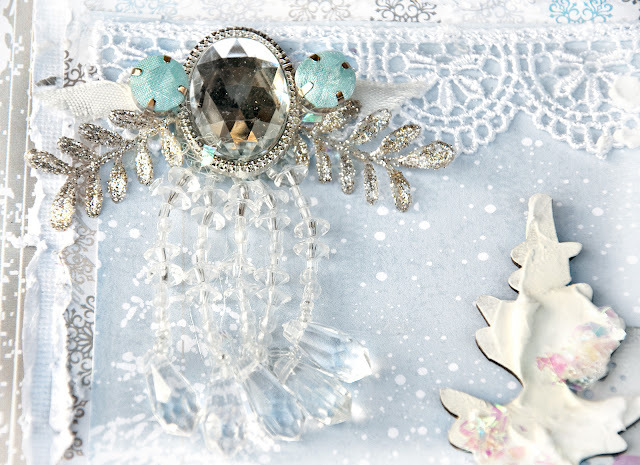 You can see how the ZVA crystals just dazzle on this piece. Thanks a million for taking your time here. Hi Scrappy Friends. I am passing along some fun news. 2. Commitment to a minimum of 2-3 projects per month. Projects can be layouts, cards, mini albums, mixed media or altered. One of these projects should be a layout. 3. One of your posts every 3rd month should include a tutorial. 4. 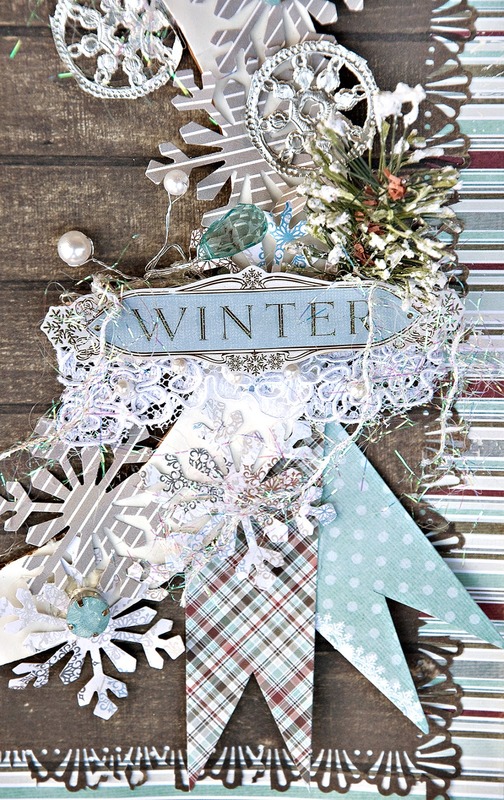 Submit project blog posts with links to products in the PaperCraft Scandinavia store. 6. 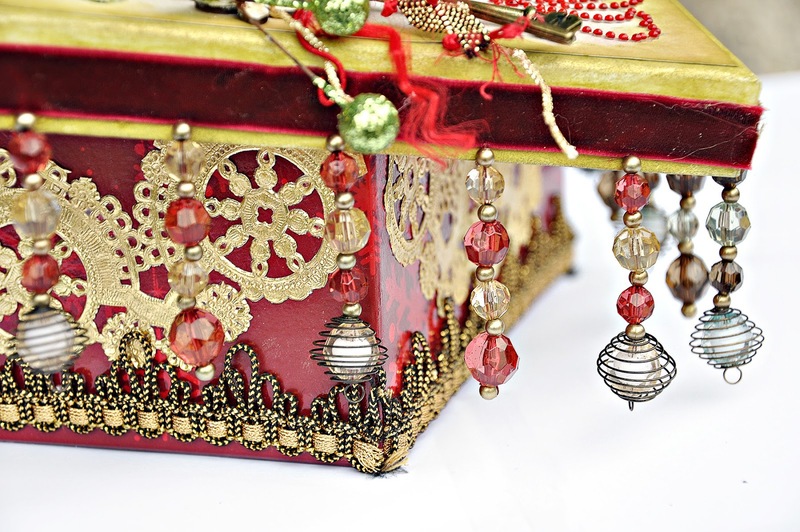 Publish projects to your personal blog. Posting the projects to galleries. 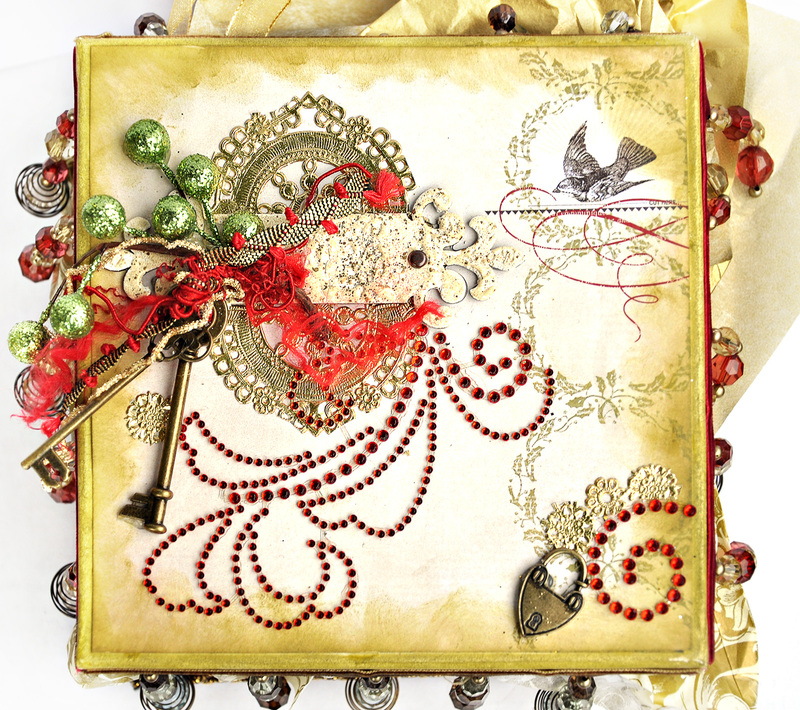 Participation in blog hops. 1. You will receive a generous welcome package from us with the possibility of making a wish list for your favorite products. 2. Generous product shipments filled with Inkido products to create with. 3. Your picture, name with a link to your blog listed on our Blog. 4. Access to an exclusive Design Team Facebook group to share and learn tips, tricks and techniques. 5. Your assignments will be provided in calendar form in advance. 6. 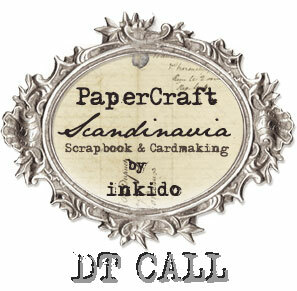 A specially designed PaperCraft Scandinavia Design Team badge for your blog. 1. Short Biography. We want to know more about you! Also, tell us why you think you would be a perfect fit inkido´s design team and what your favorite projects are. 2. A link to your blog, Facebook, creative resume (if applicable), and any other galleries you want to share with us. 3. List any other design teams that you are currently on. 4. Post your 5-6 favourite projects on your blog, name the post “Inkido DT Call” and include the link in your application email. E-Mail all of this to inkidodtcall@gmail.com by December 28th , 2012, midnight. Applications must be received by December 28th to be considered. If selected you will be notified via email and the new team will be announced here on our blog and on facebook. Questions? Email the above address with the subject of "DT Call Question". 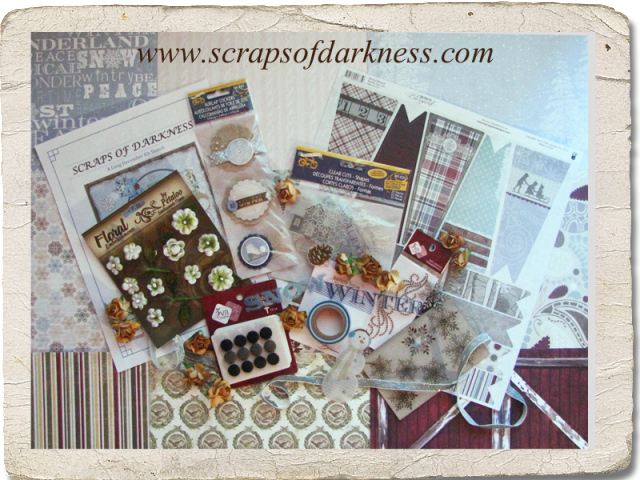 Here is the wonderful Scraps of Darkness kit, Long December. 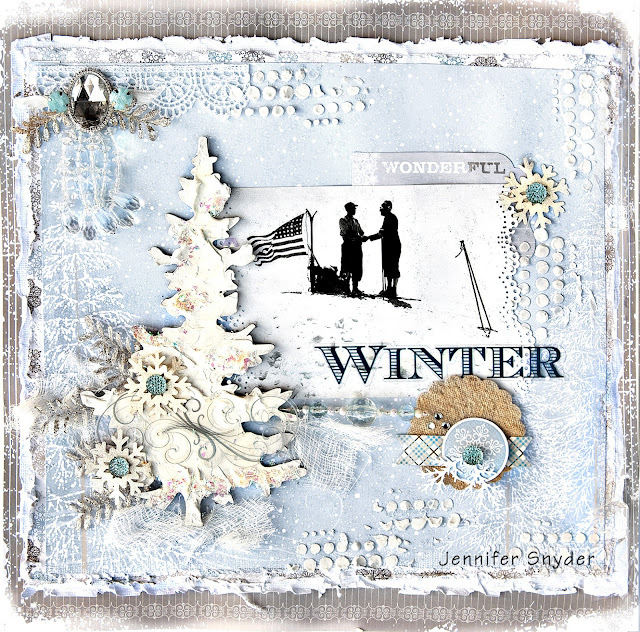 This kit is full of coolness ( as in winter chill) to complement those snowy shots you'll want to take as the snow piles up. If you live in a place that is having summer or nice weather, then you'll want use this kit to show off your amazing photos of sunshine to show the rest of us what we are missing. Because that's what friends do for each other. LOL. This month's kit featured some absolutely fun and unique items including the popular handcrafted stick pins made by Mandy Harrell , craftysprinkles. These pins are exclusively found in Scraps Of Darkness Kits. Long December by the Counting Crows. This is based on the December Sketch by Charlotte Jenkins. 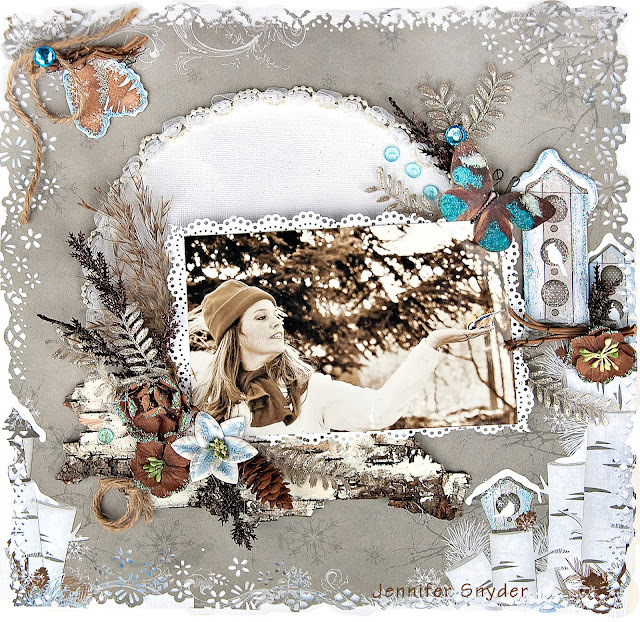 She has a wonderful new sketch each month for us to try. 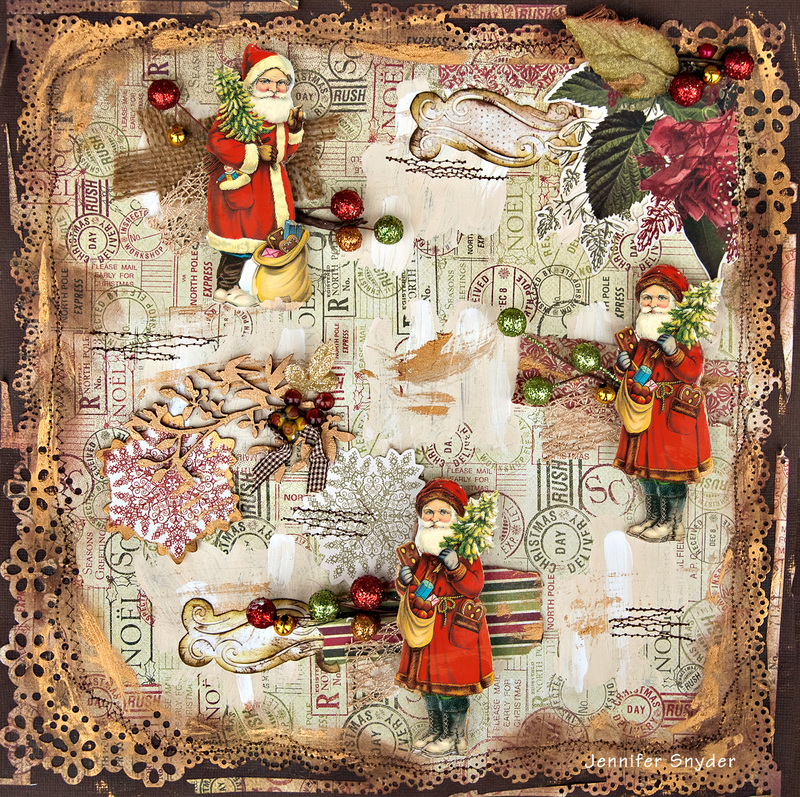 This layout uses the Little Yellow Bicycle - Winterings collection and a Dusty Attic Christmas Tree #2 DA0648. 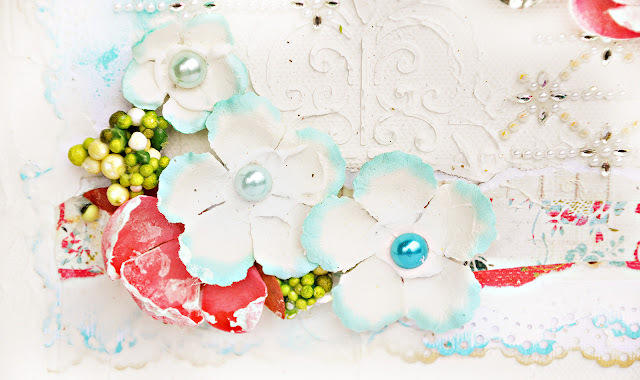 I painted with gesso first, then frosted with molding paste too create texture. I sprinkled with Stampendous Shaved Ice for a little winter chill. The gem at the top is a piece from Blue Moon that I bought on clearance. Yeah for the clearance bin. This photo was taken from the University of Washington flickr project and has no restrictions as to copyrights. 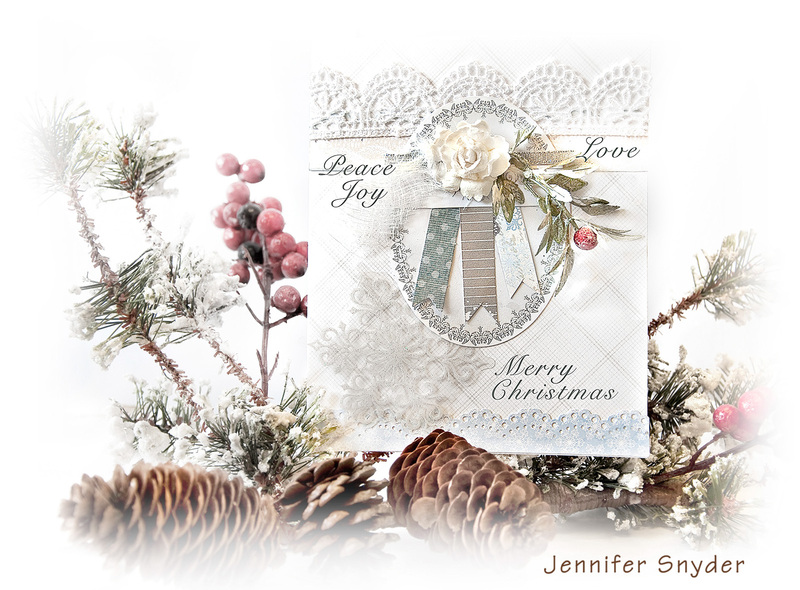 Here is a card I made with the Long December kit. This features the Little Yellow Bicycle - Winterings collection. I don't really make cards too often. Tis the season and I need to send some out. This paper was perfect for what I wanted to do. I wanted clean, crisp and wintery feeling. 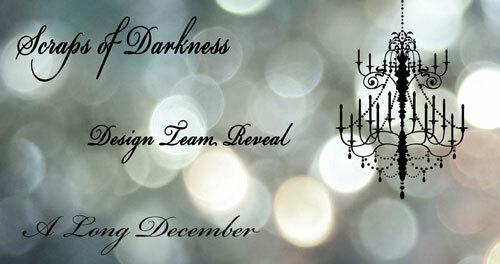 Please join us at Scraps Of Darkness for some fun. Drove up to Hillside Manor sometime after 2 a.m.
Blue Fern Studios - gorgeous new chipboard designs. This stuff is so intricate looking. They are having their first giveaway. Get in on the fun! I am. 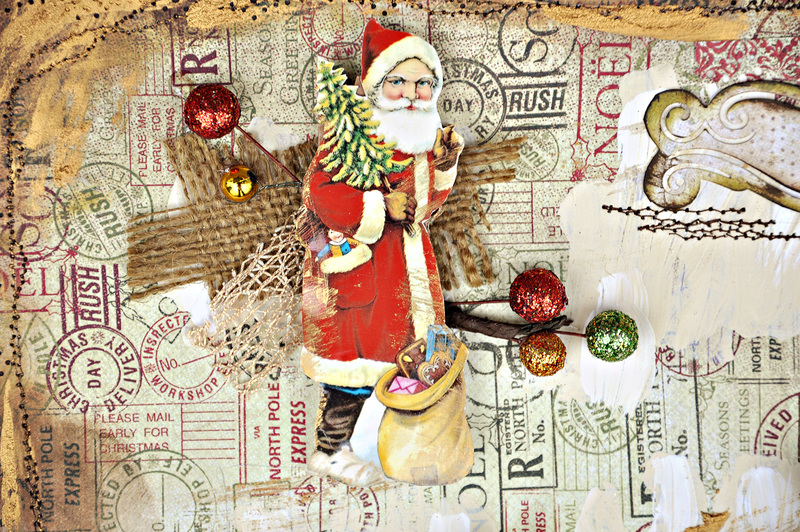 Santa's coming and he's coming with a ton of Rub N Buff - slathered here and there and all over this piece. This layout has so much Rub N'Buff on the edges that I could refinish piece of furniture with all the gold leaf wax from this layout. I sure do love Rub N Buff, apparently. Rb N Buff comes is silver too. Wait till you see what silver can do. 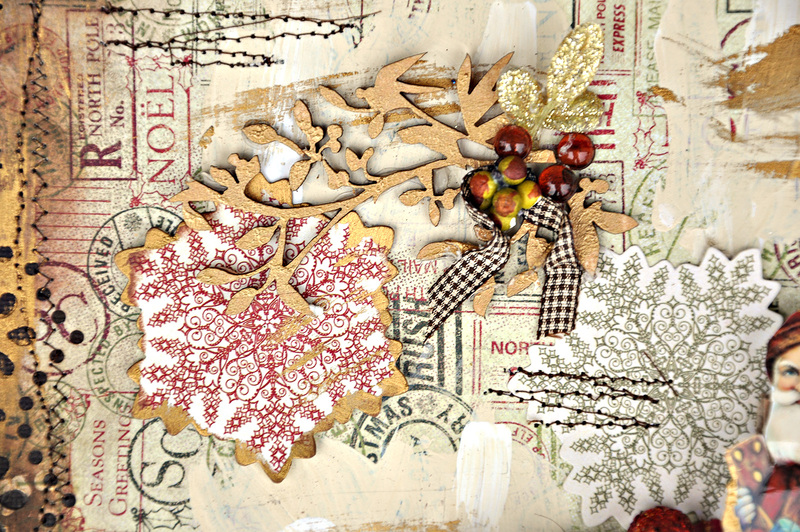 I also really love this Kaisercraft Collection, Twig & Berry. 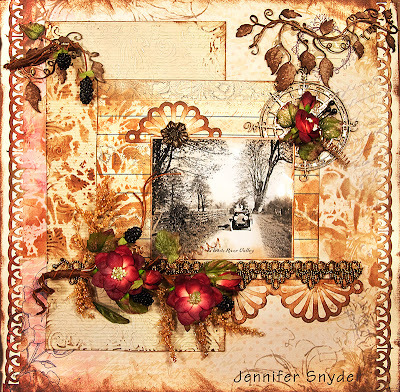 I really enjoyed the sketch below based on ‘Relax’ Layout By Danielle Krivan. It certainly gave my mind a challenge. I have Santa mounted on 1/4 inch thick cardboard to make them pop and give this dimension. It also gave me a little room to stick the floral sprays of balls. Oh by the way....in case you don't know what Rub N Buff is. It's wonderful stuff and is sold in hardware stores, craft stores, any place that sells refinishing supplies with the stains and paints. Thanks a bunch for looking at my work.